The wonderful people at Country Baskets sent me this delightful hamper full of craft bits and bobs to utilise in this challenge. It's huge. The items are absolutely gorgeous. It's the kind of delivery that will make you 'Ooooh!' and 'Ahhhhh!' in delight. 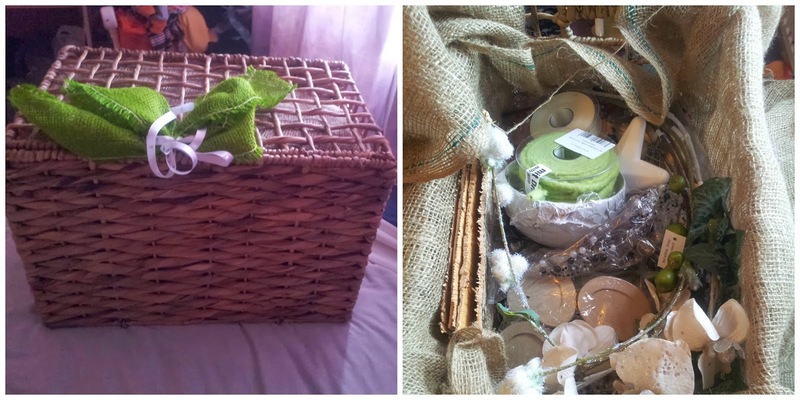 In short, a crafters hamper of eden. Sure I had ideas. I had ideas a plenty. I always have an abundance of ideas. Ideas aren't the problem, my complete and utter lack of ability to execute them is where the problem lies. So after five epic fails, 12 tantrums and much exasperation I finally created something that The Toddler didn't laugh at, too much. 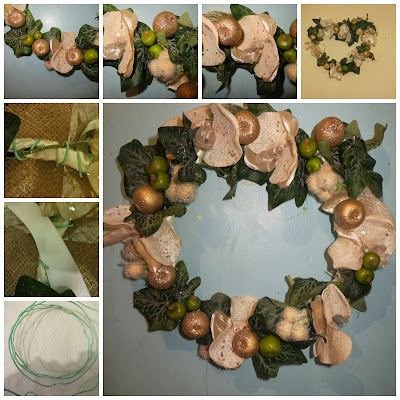 I'm sure there are far more technically correct and tidier ways of doing this, but here's how I fumbled together my rustic christmas wreath. 2. Using some ivory coloured ribbon I started to wrap this around the circlet to provide a more aesthetically pleasing frame. 3. Using a mixture of florist wire and a glue gun, I made my way around trying awfully hard to look like I knew what I was doing and started to attach the decorations. It sounds incredibly simple and would probably take any normal person a fraction of the time it took me. It may be slightly rustic looking. It's far from perfect. However, it's one of the few handmade things that I've actually completed and thanks to the quality of materials at hand manages to disguise a great portion of my clumsy ineptness. Due to it's flexible frame it can be both a traditional circle wreath or a quirky rustic heart shaped wreath. To view some of my epic fails along the way to creating this feel free to have a look laugh *here*. * Be prepared. Plan everything first. Ensure you have the right tools before you start. * Hot glue on the tip of your thumb, hurts. A lot. * Figure out how to insert a new glue cartridge before you start, not when you only have one spare hand. * Plastic stems are incredibly hard to cut. * Don't try and work with whole coils of wire, you will trip up, get tangled up and swear. A lot. Measure and cut what you need first. * Have fun. Accept it doesn't have to be perfect. The beauty of making something yourself is that it can reflect you. This obviously reflects my eclectic, random and somewhat messy nature. * You don't have to be crafty to craft. * If you're not a naturally intricate and neat type of person, refer to your creation as 'rustic' and 'charming' these labels hide a multitude of sins. This is an entry into Country Baskets Festive Face Off competition. 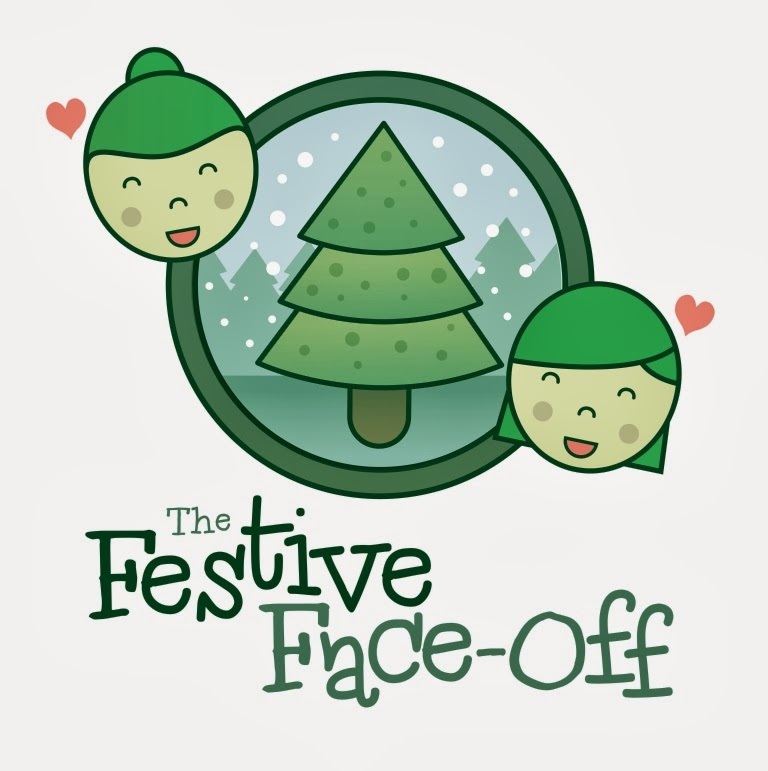 ⋅ Labels: competition, country baskets, craft, crating, festive face off, festive wreath. You did a great job. :) Thank you for sharing. how can you say you are not crafty??? No you will need to read mine later this week to see you dont quite qualify for least crafty person on the planet. I love the nostalgic feel of this! Lovely! Good luck!